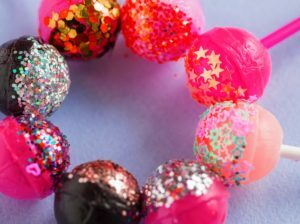 Make Candy Pacifier Party Favors in 4 Easy Steps! Baby shower favors can be tricky. You want to give your guests something they’ll love but something that’s also very on-theme. We have a perfect idea that’s sure to get your guests buzzing – and it’s a fun craft, too! Gather together Lifesavers mints, gum drops, prepared royal icing, a piping bag with a small tip, and ribbon. We offer both gumdrops and Lifesavers mints in bulk to help you save on this project! Next, use another dot of royal icing to secure a gum drop to the top of the T-shape (the gumdrop should be centered over the opening of the top mint). Let dry for several hours. Thread a ribbon through the bottom mint and tie into a decorative bow. Hang from a favor tree, peg board, or display on tables. Such a cute idea! Want to see a step by step tutorial? Check out this great walkthrough (complete with pictures!) from Crystal & Co.
Chewing Gum in Bulk Makes this Science Project Easy! Which Gum Blows the Biggest Bubble? -You’ll need: a variety of bubble gums (3 brands will do! ), a ruler for measuring the bubble size, a piece of paper, and pen or pencil. 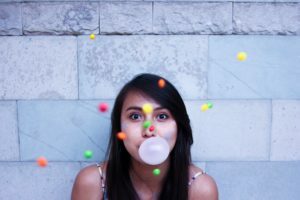 Blair Candy can help with the 3 brands of chewing gum in bulk! -Start by making a table on the sheet of paper that lists the bubble gum brand and then has open spots for at least 3 trials. You’ll be measuring each gum bubble size 3 times and then finding the average to see which one produces the best average. -Once you have your data table, make a hypothesis or prediction as to which gum may produce the biggest bubble and why. -Chew each brand of bubble gum individually for a few minutes ot soften it. Blow a bubble and when you think it’s at its biggest size without popping, have a friend measure the diameter of the bubble. Record your findings in the table. -Repeat each brand of gum 2 more times until each brand has been tested a total of 3 times and the bubble sizes are all recorded. Take an average from each brand of gum and then see if the gum with the largest average matches your hypothesis. As you do the project, talk about ingredients in gum that make it stretchy and how different types of gum (chewing gum vs. bubble gum) may produce different results. No matter which brand does the best, your students will have a fun activity to explore. Sour Patch Jelly Shots: Lay out a number of plastic party shot glasses and place a few Sour Patch Kids candies into the bottom of each glass. Pour 1 cup boiling water into a measuring cup and stir in a packaged gelatin flavor of your choosing. Whisk in an additional 1 cup of vodka. Pour the gelatin mix into each of the shot glasses and refrigerate until set. Serve with another sour gummy candy on top or a bit of whipped cream. 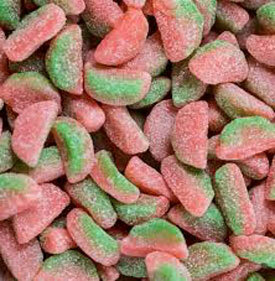 Sour Watermelon Slush: Soak ¼ cup of watermelon sour gummy candy in about 1 cup of vodka overnight. Make sure to reserve the soaking liquid! Then, in a blender, add some of the candy infused vodka with lemon lime soda, lemonade, and pink food coloring (optional), as well as some ice. Create a blend that’s to your taste. Blend to combine then pour into glasses. Garnish with sour watermelon gummy candy and serve. Both of these candy cocktails are sure to be a hit! Fall is right around the corner and that has us thinking about candy apples! Candy apples are a delicious treat that are perfect for serving up at parties or for enjoying after a favorite fall activity, whether it’s pumpkin picking or jumping in leaf piles! Here’s how to make your very own candy apple at home using Jolly Ranchers candy. Measure out 2 ½ ish cups of your favorite unwrapped Jolly Rancher candies. You can blend together two flavors or stick to a single flavor – your choice! Just keep in mind that the flavors will affect the color of the candy coating. Make sure you have enough by ordering bulk Jolly Ranchers from us! 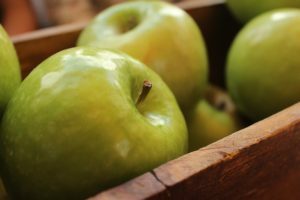 Take 4 apples (Granny Smith or Red Delicious work great!) and stick 4 pointed popsicle sticks or skewers into the top of each apple. Preheat your oven to 350 degrees and prepare a medium, oven-safe pot. Place the unwrapped Jolly Ranchers into the pot and then place in the oven to heat until it’s fully liquid, about 10 minutes. Do not stir unless necessary as it’ll introduce air bubbles into the candy liquid and that will result in bubbly candy coatings. Make sure it’s removed from the heat before it starts to bubble. Place pot on top of the stove or on a clean, heat-safe work surface. Take the skewered apples and dip each apple quickly into the candy mixture and then pull it out of the mixture, letting it drip over the pot for about 30 seconds. Place the apples on a baking sheet lined with waxed paper. Let cool completely until the apples reach room temperature. Enjoy! At Blair Candy, we’ll make sure you have enough Jolly Ranchers on hand for your candy apple project, so make sure to shop for bulk Jolly Ranchers with us to save! Take Your Tastebuds Abroad with European Candy Bars & More! Traveling to a new destination can be so very exciting, but sometimes our budgets or our busy schedules can keep us from hopping on a plane whenever we get the urge to explore. Thank goodness for foods that can transport us to a completely new country! 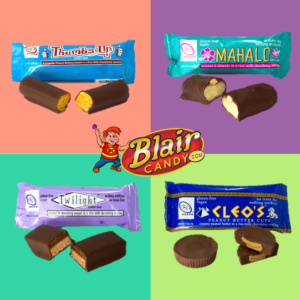 At Blair Candy, we stock snacks and candies from around the globe, making it easy to travel to a far off destination without ever leaving your front doorstep. 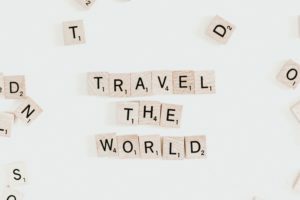 For example, if you’re looking to jet set to Paris or London, let us make the journey for your tastebuds possible with our selection of European candy bars. Found in markets throughout Europe, these sweet treats are enjoyed by people of all ages. Whether you’re looking to recapture the taste of your last visit to Europe or even prepare yourself for your first trip across the pond, our selection of European candy bars makes for a sweet introduction. In addition to European candy bars, you can also feel free to get creative with other foods by making plans for an International dinner party with friends and family, or having country-themed picnics to showcase regional cuisines. No matter which foods you choose to enjoy, know that’ll be a trip in and of itself! Gluten allergies are more common than ever before so it’s important to be considerate of food allergies when bringing snacks or treats into your child’s classroom. If you’re looking to send something to school for the class to share, make sure you’re being allergy-friendly by choosing nut-free and gluten-free candy bars that can be easily given out as a birthday treat or as part of a holiday celebration. One of our favorite gluten-free candy bars to share with students is our Twilight candy bar, which is completely gluten-free and vegan, making it a great choice for accommodating a variety of dietary needs. Each bar showcases fluffy chocolate nougat topped with a thick caramel and rice-milk chocolate coating. It tastes just like a Milky Way bar! Each box of this gluten-free candy bar includes 12, making it perfect for sharing with the class as a special treat. As an extra touch to surprise your child’s classmates, include a fun bow wrapped to each candy bar with a small toy, pencil, or stickers attached. It’s sure to be a hit! Tossing from parade floats in homecoming parades. We recommend anything that’s wrapped from our selection of parade candy in bulk so that it makes for easy catching and cleanup! These candies are also great for cheer teams to toss into the crowd during the big game! Building favor bags for homecoming dances. We recommend setting up a candy buffet for school dance attendees and then letting them build their own candy bags! We have all of the supplies you need to get started. Outfitting concessions stand for the big homecoming game. We recommend stocking hearty snacks like sunflower seeds, beef jerky, crackers, or Francine’s Fudge to keep your fans well-fed between touchdowns! No matter how you celebrate homecoming, make sure Blair Candy is supporting your home team with our selection of snacks and candy in bulk! Bulk Nerds Candy is a Teacher’s Secret Weapon! The school day can be a whole lot of fun when you have the right activities or lessons planned. But keeping things interesting can be a challenge. Luckily, we have a fun and yummy option for teachers who might want to spice things up with a sweet experiment or art project! 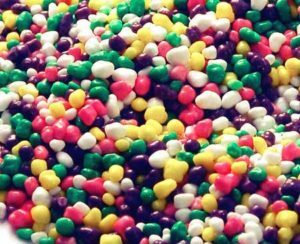 To start off, grab bulk Nerds candy to use in your classroom in one of these two exercises. Make sure to have extra on hand for your students to enjoy once the experiment is finished! Inflate a Balloon Experiment: Grab 12 oz. bottles of soda, bulk Nerds candy, and balloons. Pour some of the Nerds candy into the balloon. Play with varying amounts of Nerds in each balloon to gauge different reactions. Next, attach the balloons to soda bottles. Don’t let any of the candy spill into the soda – yet. Then, when you’re ready, tip the balloon so that the candy falls out of the balloon and into the soda. It’ll produce a reaction that will inflate the balloons. See how big each balloon gets in relation to the amount of candy you put in! Painting with Candy: separate your Nerds candy by color and place some into separated paper cups or water glasses. Fill with a little bit of water and let the outer coating of the candy dissolve and color the water to make a sort of watercolor paint. From there, use paintbrushes to dip into the color and create your masterpiece! Let dry fully before displaying. And of course, after these projects, enjoy a handful (or two!) of Nerds with your class.